Last night the Caps punched their ticket to the Stanley Cup Final for the first time in 20 years. The expected thing would be to be mad. To be upset. To be angry. These guys beat the Penguins to get to this point. They got all of the bounces, had to be dirty, and beat a beaten Penguins team. They got all of the lucky breaks and that's the only reason they got where they are, taking on a team with a long history of choking who choked away their latest chance to go to the Cup. A team who, historically, blew a Game 7 in 2011, blew a 2-1 series lead in the 2015 Stanley Cup Final, choked away a 3-2 Eastern Conference Finals series lead in both 2016 AND 2018. But truthfully... I don't really care. The last two years the Penguins have run the gamut and done the damn thing. The first team to win back-to-back Cups left the fan fairly fulfilled. The teeth gnashing of their untimely demise in their attempt for three was minimal, with people understanding that they're probably pretty tired and clearly injured. It was time. It was fun, but it was time. As a fan, the last two years were fun but, frankly, exhausting. Mentally I, a bystander, was worn out as they entered their attempt at a three-peat. The feeling of every round's newest challenge wasn't pulse pounding but groan inducing. To be able to sit back and watch the playoffs like this, with no rooting interest, has been refreshing. Would it be nice to still be going for a third Cup? Sure! Absolutely! At the same time it's been... kind of nice to mentally, emotionally relax. To recharge the batteries. To just look back and be. The thought of making near unbreakable history with three Cups in a row in the salary cap era was fun and would have been just phenomenal, no matter how exhausted I would have felt after. But with "only" two Cups I'm fine "settling." Nothing short of the Caps winning three in a row will bother me. Do I want the Knights to win? For Fleury? For the city? For the incredible story line that would be history making in that no expansion team has ever, or likely will ever again, win it all in the first year? Absolutely. 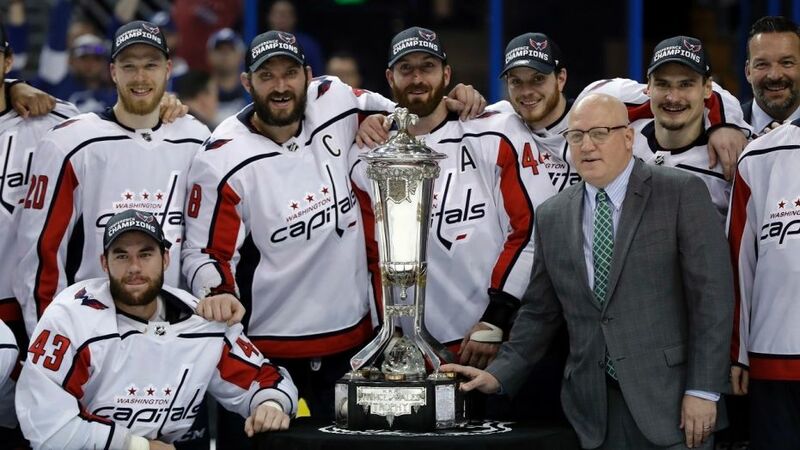 If Ovechkin gets his Cup, if he finalizes his legacy and lifts Lord Stanley, will I bet upset? Honestly, no. Tom Wilson and TJ Oshie aside I don't really care. I'd rather they not win but hey I'm just here to have fun for the first time in a long time. Good for them. But overall I just truly do not care. And it's really glorious.